Once again our picture was featured in Sunday Snapshots over at Clan Donaldson. Head on over to see the photos! Also taken during the time slot I was assigned, but not the one featured. 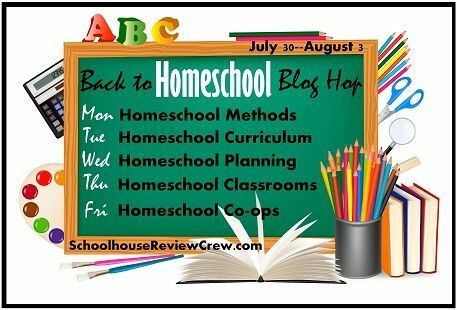 Welcome to the Back to Homeschool Blog Hop. Today's topic is Homeschool Curriculum. Be sure to check out the previous post on Homeschool Methods. I have mentioned school curriculum I use in numerous posts, so instead of boring you with the same old thing, I am going to thrill you with new items for this school year. Life of Fred Fractions. This is one of four math books James will be using this year. I debated and debated about what to do with James for math. He has been using A Beka math for the last six years. I love A Beka. I love how through and intense it is. I love how there is so much review. I love how well my kids score on state tests in math. I even love how colorful the bright yellow workbooks are. James is gifted in math and did well in A Beka. Problem was, he was bored. A Beka is the same thing, but harder, year after year. As a result of this boredom, James began to hate math. So I gathered the advice of those moms who have been through this before and it led me to Life of Fred. I told James we would try it for one year, and then return to A Beka. I love A Beka and switching programs is like going through a bad break-up. Apologia's Exploring Creation with Human Anatomy and Physiology. I am very excited about this structured science program. I have teamed up with two other moms, and we are going to present lessons and complete experiments together. As the boys get older, it becomes more important for me to rely on other moms to help in areas in which I fall short. This wasn't such a big deal when they were all in elementary school, but now James is entering sixth grade. Not only do I lack a lot of science knowledge, but I also lack accountability with science. It tends to get pushed aside until we just pretend it doesn't exist. It is my hope that the combination of Apologia's awesome science journaling and a commitment with other families will help me get some science into my kids. I am really doing this for James' sake, and the other kids are along for the ride. Institute for Excellence in Writing's Linguistic Development Through Poetry Memorization. My kids have been interested in poetry for some time, but I have never been very good on the follow through with getting them going. IEW's memorization program offers three different levels of poems, allowing for all the boys to do the program at the same time. The included CDs eliminate the need for me to read the poems, and the uncertainty of the correct reading. It is also low teacher commitment, thus meaning that it will probably get done since it falls on them to complete it, and not a commitment from me. Possibly the most exciting changes for me are the changes to our history program. The younger boys will be continuing with Story of the World. It has served us well the last five years. James will begin Heritage History, which I reviewed for The Schoolhouse Review Crew this last spring. You can read my review of that here. At the homeschool convention I attended, I discovered History Through the Ages by Home School in the Woods. I am planning to use their amazing historical timeline figures with James, and the other boys can follow along. I will not do this timeline with the younger boys because the program is so detailed and informative that I feel parts of it will be lost on the younger kids. They will continue with their already started timelines, and begin this program in fifth grade. Finally, history will contain mapping activities from Knowledge Quest's Map Trek program. I recently reviewed this program as well, and you can find that review here. Whew! This year has many changes, some planned, some unexpected. It is going to be a busy year of learning, that's for sure! What are some of your curriculum choices for the upcoming year? I am pleased to announce that Stephanie has won my Never Stop Learning Giveaway. Thanks to everyone who entered! Welcome to the Back to Homeschool Blog Hop! Today's topic is: Homeschool Methods! Please check back everyday this week as I attempt to write something interesting about topics of interest to homeschoolers! I like to think of our homeschool as a classical schooling environment, but I know that isn't completely accurate. 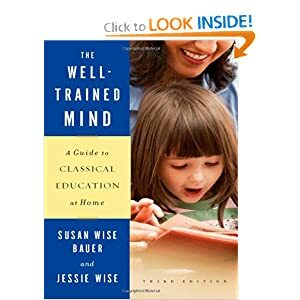 We do have a strong focus on history, writing, music﻿, and ancient languages; however, we are not as focused as a true classical schooling environment would be. Using many materials and ideas presented in The Well Trained Mind, the younger kids do the same subjects every day in the same order. They start school at the same time, and finish about the same time everyday. This works well for my kids. They thrive on the structure, and by knowing what comes next and what is expected of them each day, most of the whining and moaning about school is eliminated. With James, we have entered completely new and uncharted territory for us. I have no idea what method or style we are going to use. In general, James has always needed less structure than the other kids. We tell him what to do and he gets it done. That worked well for fifth grade. Now he is entering sixth grade~ middle school. I am hoping that my method of telling him what to do and he does it works again but, after reading many other blogs, I realize this might not be the case. The Well Trained Mind focuses on moving the Logic-age student to more independent work. Let's hope it works. Something that helps me beyond belief is having a schoolroom. I know everyone is not blessed enough to have this awesome space. When we looked at houses we made sure the one we got had the possibility of having a room just for schooling. Good thing because four months after we saw this house we started homeschooling. This space helps structure our day and define our year. It may sound silly, but I am not sure I would still be homeschooling without a space specifically for schoolwork. How do you do what you do in your homeschool? 1100 miles round trip and we are home again. Okay, not really. We only rented this beast for a trip while our van's in the shop. First stop was the Little League Museum. Some Call It Natural and Mama Chocolate! There are over 30 blogs in this hop and they all have at least $25 worth of educational materials up for grabs! After you enter the giveaway here, go to the bottom of the post, and go to all the blogs to enter their giveaways too! A fellow homeschooling mom recently shared a powerful piece of advice: You won't survive years of homeschooling if you do not part with items you don't use. If you don't need it, give it to someone who does!" Powerful words and they hit home with me. I have several wonderful curriculum that just sit in bins, never to be used. Thank goodness for fun blog hop giveaways. Now my unused items can find a new home! Classical Academic Press's God's Great Covenant allows students to follow the life as Jesus as he fulfills all of God's promises. This giveaway includes the student text and the teacher guide. You can read my full review of this product here: FULL REVIEW, or you can click here to visit Classical Academic Press's website for more information. Why am I parting with these texts, you might ask? They were given to me for review purposes, and we are not able to fit them into our curriculum at this time. The copies you received were used for the review, but they are brand new with no marks inside or out! If you were to buy these texts, you would be spending over $50! But by entering my giveaway, you have the chance to get them for free!!! How to enter? Just follow the rafflecopter directions below. I will contact the winner after the giveaway ends on July 29, 2012. This contest in open to any person residing in the continental United States. 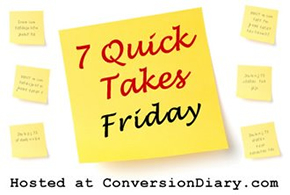 Thanks to Jen over at Conversion Diary for hosting! Adoption Update: Not a lot to report this week. Michael and I had to get college and grad school transcripts to send in. I thought that was odd. Since when do you need to go to college to be able to adopt? Having my Southern Mother-in-Law here for a few weeks is so great. Especially when she admires Malcolm and says, "You look just like a ripe peach!" Speaking of cute and funny expressions, Margaret says "tumbler" for her tummy. "Mama, my tumbler is hurting." So, so cute! I adore pinterest, but also completely agree with this post about pinterest found here. Can you tell I'm tired? These Quick Takes are turing out to be really quick! So... are you thinking of commenting? Super Duper Publications was created by a husband-wife team to develop high quality and creative learning materials for children. There are hundred of products to choose from, including educational Apps for Apple or Android, language development resources, and many, many more. One such product is the board game Jeepers Peepers! Designed for ages five and up, the idea of the game is simple: each player wears a pair of colored glasses and places a photo card in the slot above the glasses. By asking yes or no questions to the other players, try to figure out your card before anyone else. The game is harder than you think. Even after you have determined the color or category of your item, there are still thousands of possibilities. Okay, not really thousands. But it may seem like that while you are playing. I thought Jeepers Peepers was fun because everyone looked really silly with the glasses on and some of the guesses when you saw what they were wearing on their head made it really funny. I liked it because it was funny. I liked it because I like games where you guess things. Jeepers Peepers retails for $29.95 on the Super Duper Publications website. As a reader of my blog, you are entitled to receive 30% off this game if you purchase it before August 31, 2012! Just enter the coupon code: BLGJP30, and you can own Jeepers Peepers for only $21.00. Many other members of The Schoolhouse Review Crew are reviewing products from Super Duper Publications. Click on the box below to check out their reviews. 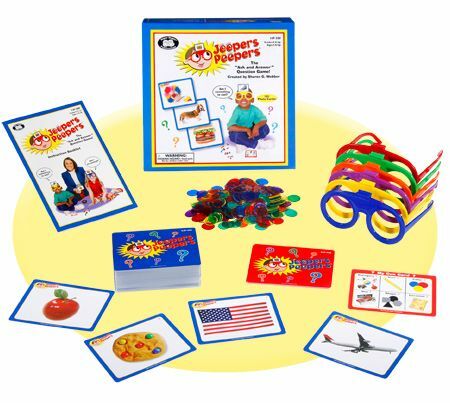 Disclaimer: As a member of The Schoolhouse Review Crew, I received a free copy of the Jeepers Peepers Board game in exchange for an honest review on my blog. I received no other compensation.